Elite Stat: 243 of Russell Wilson’s 295 passing yards came in the air before the catch. Wilson was given a better platform to perform by his offensive line this week, and was under pressure on just 30.3 percent of his dropbacks. Even on those pressured plays, he completed four of five passes for 89 yards, while scrambling for another 38 on the ground. Wilson was at his best on the move and ad-libbing behind the line, delivering some spectacular passes down field and carving up the Indianapolis secondary. Elite Stat: Le’Veon Bell broke seven tackles from 35 attempts this week. After a sluggish start to the season, Bell was back to his best this week against the Ravens, aided by Baltimore being absent their best interior defender in Brandon Williams. Bell racked up 144 yards on the ground, breaking seven tackles and gaining almost half of that yardage after the catch while adding another 42 yards through the air as a receiver. Elite Stat: DeAndre Hopkins gained 2.97 yards per route run, second in the league this week. With rookie QB Deshaun Watson suddenly playing excellent football, Hopkins is back to being one of the game’s best receiving threats. Hopkins was thrown at a dozen times against the Titans, catching ten of those passes for 107 yards and a touchdown. He beat five different Titans defenders for catches, including their top three corners over the course of the game. Elite Stat: Keenan Allen gained 3.73 yards per route run, the most in the league this week. The Chargers ultimately fell short of a win against the Eagles, but Allen had himself an impressive day in a losing effort. Allen caught five passes for 138 yards, with 95 of those yards coming after the catch. Rookie cornerback Rasul Douglas wasn’t able to stick with him across the middle of the field, giving up two of those catches and 59 yards. Elite Stat: Charles Clay gained 5.33 yards per route run, the most among players at any position. Clay was the chief beneficiary of Tyrod Taylor’s impressive game against the Atlanta Falcons. Clay led the Bills in targets with seven, and came away with five catches for 112 yards, both also team-leading numbers. Taylor’s passer rating when aiming just at Clay was 113.7, and he beat four different Falcons players for receptions over his snaps. Elite Stat: Travis Kelce caught all four passes thrown his way when lined up in the slot. Kelce was once again the focal point of the Chiefs offense on Monday night against Washington. He caught seven of the eight passes thrown his way for 111 yards and a touchdown, giving Alex Smith a perfect passer rating when throwing his way, but he also carried the ball once for three yards out of Kansas City’s trick-look backfield. Elite Stat: Jason Peters didn’t allow a single pressure this week. The Eagles offensive line has started to play to its best, living up to the No. 1 ranking we gave them rolling into the season on paper. LT Peters was perfect in pass protection against a formidable Chargers pass rush, and he was no slouch in the run game either, destroying Corey Liuget in particular on double teams to his inside. Elite Stat: Andrew Norwell allowed just one hurry across 33 pass blocking snaps. Playing the Patriots defense was the spark the Carolina Panthers needed to rediscover their mojo on offense. Norwell allowed just one hurry as a pass protector, but his real standout play came in the run game, where he was able to consistently move bodies at the line, moving Malcolm Brown in particular enough to open holes for the Panthers running backs. Elite Stat:Travis Frederick allowed two total pressures from 40 pass blocking snaps against the Rams. Frederick finally reminded people that he is arguably the best center in the game with his performance against the Rams this week. Frederick allowed a couple of pressures, but he was pass blocking 46 times, and his run blocking more than made up for that by executing his assignment in the zone-scheme Dallas runs to perfection. Frederick had struggled comparatively over the first three weeks, but this was him back to his best. Elite Stat: Brandon Brooks allowed no pressure at all from 34 pass blocking snaps. Brooks was another member of the Eagles offensive line that largely had its way with the Chargers defensive front. Brooks didn’t allow a single sack, hit or hurry in the game, but also run blocked well and wasn’t penalized all game. The Eagles racked up 214 rushing yards in the game, and averaged 5.9 yards per carry on runs that went immediately either side of blocks thrown by Brooks. Elite Stat: Lane Johnson allowed just one hurry this week against the Chargers. 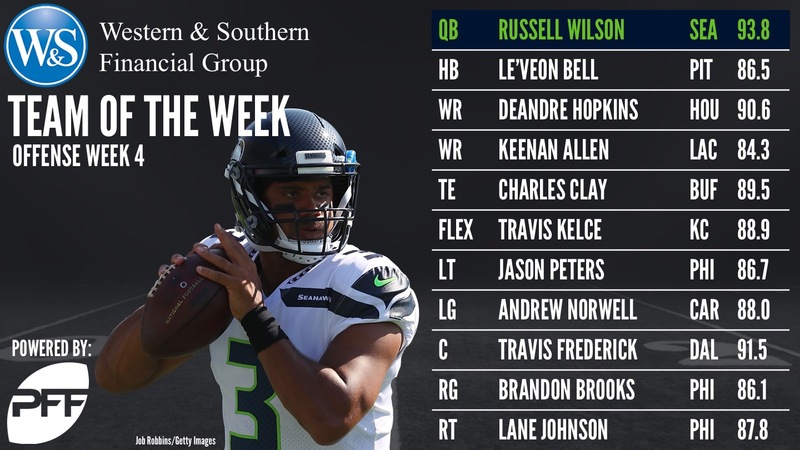 Johnson keeps his spot on the team of the week after another fine performance, one in which he surrendered just one hurry across his pass blocking snaps. Like the rest of the Eagles line, run blocking was where he really distanced himself this week, and runs either side of his block went for an average of 6.7 yards against the Chargers. Elite Stat: Aaron Donald notched nine pressures against the Cowboys. Though he didn’t record a sack, Donald was back to full force against the Cowboys, and in particular set about victimizing LG Jonathan Cooper. Donald came out of the game with nine total pressures from 40 pass rushing snaps, and recorded a couple of stops in the run game. Donald did the majority of his damage against Cooper, but moved around the line enough that he had winning snaps against Zack Martin and La’el Collins too. Elite Stat: Gerald McCoy had four total pressures and three defensive stops against the Giants. Another player who failed to register a sack, but was otherwise a major thorn in the side of the offense was Tampa Bay’s McCoy, whose quickness and penetration was consistently blowing up plays all game against the Giants. McCoy notched four total pressures and four defensive stops in the run game, but also blew up multiple other plays for other Bucs defenders to finish. Elite Stat: Everson Griffen had seven total pressures from 34 pass rushing snaps against the Lions. Getting to face off against Greg Robinson this week at left tackle for the Detroit Lions was always likely to see a big day from Griffen and that’s exactly what we saw. Robinson allowed a sack, hit and three hurries, while Griffen notched seven total pressures when plays against all Detroit blockers are accounted for. He also posted four defensive stops, tied for second-best on the team behind only Linval Joseph. Elite Stat: Emmanuel Ogbah led all edge defenders with a run stop percentage of 36.4 percent. Deployed largely as a pass-rush specialist, Ogbah played 42 snaps against the Bengals, but only 11 of them came in the run game, yet it was there that he made the biggest impact, notching four stops on those 11 snaps. As a pass rusher he was also impressive, totalling four hurries from his 31 rushes, including a sack of QB Andy Dalton. Elite Stat: Bobby Wagner allowed 0.17 yards per coverage snap this week, the best mark among linebackers. Wagner was everywhere for the Seahawks defense this Sunday night against the Colts. He led the team with three defensive stops, but he also recorded a sack, hit and a hurry on just five blitzed and was a monster in coverage. He also recovered a fumble and had one of the best runs of the day in returning it for a touchdown to really put the score out of hand. Elite Stat: Ryan Shazier had two pressures from seven blitz plays. Shazier made ten solo tackles against the Ravens, two and a half times more than any other Steelers defender. In coverage he was heavily targeted, seeing the ball come his way 11 times, the most on the team, and though he allowed eight receptions, he also had a pass breakup and interception to his credit. 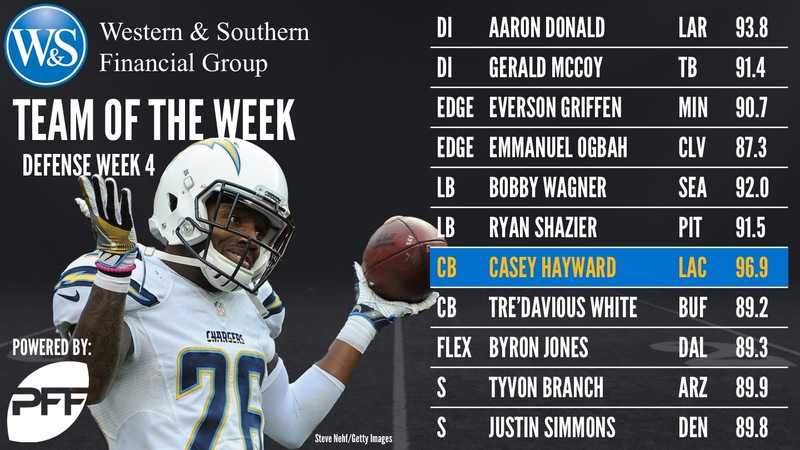 Elite Stat: Casey Hayward allowed a passer rating when targeted this week of 39.6, the same passer rating as throwing the ball at the ground. Hayward is undoubtedly one of the league’s best cornerbacks right now. Against the Eagles, he was thrown at seven times, but allowed just two receptions for 17 yards while breaking up four of the incompletions. Throwing at Hayward yielded the same passer rating for Carson Wentz as just throwing the ball into the dirt every play would have. Elite Stat: Tre’Davious White allowed just 18 yards from 44 snaps in coverage. The Bills rookie corner had another outstanding outing in a debut season that is beginning to look pretty spectacular. Aided by Atlanta’s top two receivers – Julio Jones and Mohamed Sanu – leaving the game injured, White allowed just four catches for 18 yards in the game. Even before Jones and Sanu left the game, he had held that pair to two catches for 8 yards on four targets. Elite Stat: Tyvon Branch had the best run stop percentage among safeties this week at 9.5 percent. Branch put together one of the more impressive games you will see a safety have against the 49ers. He earned excellent grades against the run and pass, posting two hits on the QB from six blitz plays, recording four defensive stops and allowing just ten yards when targeted. Elite Stat: Justin Simmons didn’t miss a tackle this week against Oakland. Elevating over Raiders WR Amari Cooper deep down the field to win a jump ball, record an interception and seal the win was obviously the highlight play of Simmons’ game against Oakland, but he was impressive throughout the day. In coverage he also had a pass breakup to his name, and didn’t allow any yardage when in primary coverage. Elite Stat: Byron Jones allowed just two catches and 15 yards from six targets. Jones is a true flex coverage defender, lining up as he does as a hybrid matchup weapon. He was targeted six times by the Rams, but allowed only two catches – one each to TEs Gerald Everett and Tyler Higbee – and those two passes went for a total of 15 yards. Jones also broke up one of the incompletions and notched a pair of defensive stops in the game. “Greg Zuerlein kicked seven field goals, how is he not the kicker of the week? !” we hear you ask. Zuerlein was fantastic, and key to the Rams win there’s no doubt about it, but he didn’t need to attempt a kick of 50 or more yards all game. All seven of the kicks he made are kicks that every NFL kicker should be making. Two of Hauschka’s kicks came from 55 yards and beyond, so for that reason he gets the nod. Pinion was outstanding for the 49ers in their overtime loss to the Arizona Cardinals, booming seven punts for a net average of 48.4 yards. His punts yielded a total of 12 return yards and he saw four of his seven punts land inside the Arizona 20 yard line. McKenzie made a big impact, averaging 7.6 yards per punt return, but it would have been even more had his long touchdown not been wiped off the board thanks to a penalty. The rookie showcased his game breaking speed and is someone to keep an eye on as the season wears on.